I’ve discovered that I share more with Mr Toad than I care to admit. Luckily I’m not talking about bulging eyes or warty green skin, rather that if I see a fabulous new knit or crochet pattern, or see exciting new projects I just can’t stop myself starting them! – I need to finish five knitted rectangles for the Twit Knit Scarf Swap. I’ve done two, and have two blocks that need edging and embellishing. – I’ve started a secret crochet project for The Chain Gang’s Valentine’s Sop Swap. 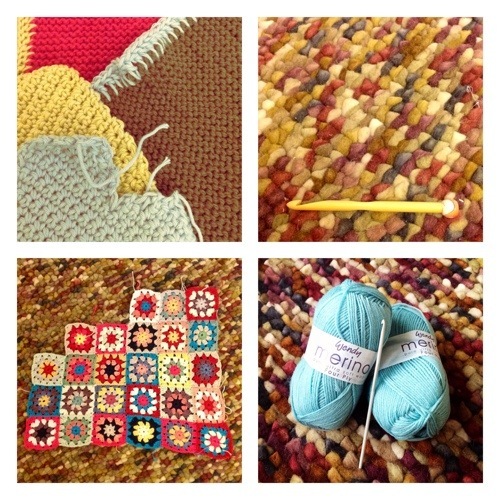 – My granny square cushion cover is still ongoing – 24 squares in, 25 to go! – And then this week I bought some fabulous new 4-ply yarn to make Tracey Todhunter’s wristwarmers from this month’s Inside Crochet. So many lovely projects, so little time… However, January did actually see some completed work – take a look! What about you? Are you a ‘completer-finisher’, able to get to the end of one project before starting another? Or are you like me and Mr Toad? Parp, parp! I love the comparrison to Toad of toad hall. I tend to have lots of projects on the go at one time so if I get stuck and loose inspiration I have another project to fall back on. But some times that does not help when there are dead lines I have to keep. Best title ever! The granny square cushion cover is coming along nicely. I promise to share my first crochet outing…..when I learn that is! Parp parp I’m afraid. I am reminded of Moley and Ratty’s amazing picnic though- let’s plan one for the summer and we can finish some projects sat on a wooley blanket and eating ourselves daft!